Journey into the romantic, lyrical music of British composer Michael Head on February 16th. Concert begins at 4 pm. 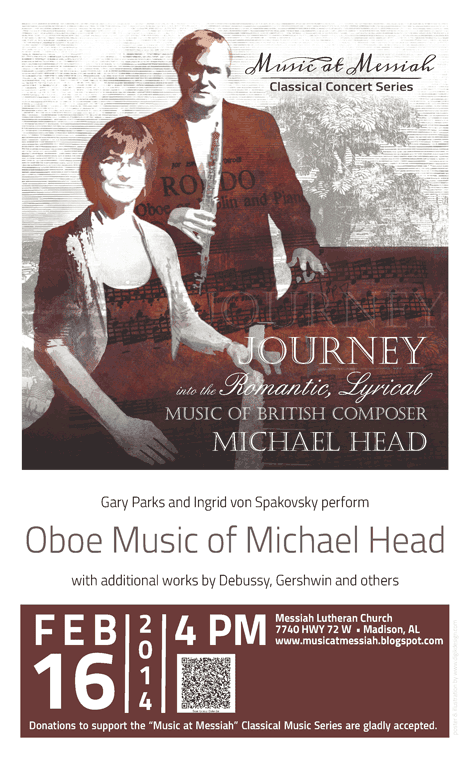 Oboist Gary Parks and pianist Ingrid von Spakovsky are set to perform the “Oboe Music of Michael Head.” The concert will feature several delightfully pleasant and lyrical compositions by Head including Rondo, Siciliana, and the Suite for Oboe and Piano. Also to be featured on the program will be several piano pieces of Claude Debussy, beautifully transcribed for oboe and piano by oboist, Humbert Lucarelli. Additional works by Gershwin, Sayre and Davies will round out the performance. Michael Head was a 20th century British composer well known as a singer and pianist who composed many art songs and pieces of choral literature. The oboe music featured in this program is mostly a result of his collaboration with Lady Evelyn Rothwell Barbarolli, the first lady of the oboe in England. Admission to the concert is free. Donations to support the Music at Messiah Classical Concert Series are greatly appreciated. Please visit our sponsorship page for advertising and sponsorship information.